Updated 7.15pm with comments after Valletta press conference - Czech Prime Minister Andrej Babiš reiterated his opposition to migrant sharing in the European Union after talks with Prime Minister Joseph Muscat in Valletta on Tuesday afternoon. He said that while his country remained ready to help in EU efforts to tackle the migration problem, it was against migrant sharing. “We have shown our solidarity by participating and contributing to a lot of programmes,” Mr Babiš said. The Czech Republic was among the countries which did not take any of the migrants who arrived in Malta over the past few weeks. Mr Babiš also insisted Europe needed to discuss the Schengen Agreement (which removes border controls among EU countries) because changes needed to be made to “defend the European continent”. Dr Muscat said the meeting was a “lively and interesting” and he thanked Mr Babiš for being “straightforward” in his approach to the issue. Dr Muscat said there was no single solution to the migration issue, but various actions, including border control, needed to be considered. “However, we cannot just erect walls,” he said. The EU Budget was also discussed in the meeting between the two leaders at the Auberge de Castille. Mr Babiš has been taking a hard line on migration and has repeatedly insisted that his country will not accept migrants from other countries, and the EU as a whole should refuse them all. Mr Babiš arrived in Malta from Rome where he also discussed migration with Italian Prime Minister Giuseppe Conte. He earlier told a Czech radio station that the EU needs a comprehensive action plan to stop migration, and his country is ready to draw it up. He also floated the idea of asking Nato to protect EU borders. 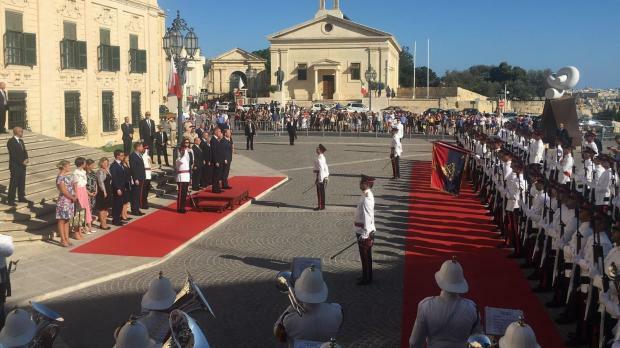 The Czech prime minister receives an official welcome at Castille Place. A billionaire businessman, Babis has become the dominant political figure in the Czech Republic and easily won re-election last October with promises to clean up and invest in the state, to stand up to Brussels and to fight illegal migration. “I am convinced that Europe must have a plan to resolve the migration question in a comprehensive way. We have lost four years foolishly debating quotas. In short, the message being sent is that Europe is open and that we have to care for everyone who comes illegally and will disperse them amongst us,” he told Radio Praha. Czech Prime Minister Andrej Babiš. Regardless of the chosen path, he said, until a solution is found, his government would not agree to take in “a single illegal migrant” – and frontline countries such as Italy, Malta, Spain and Greece should do the same.